When scheduled speaker, John Baiocchi, the Artistic Director for the Chanticleers Theatre, was unable to attend today’s meeting, Club members Murline Monet, Randy Vanderbilt, Parvin Ahmadi, Candi Clark and Jim Negri as well as guest Nick McMaster (Assistant Principal at Castro Valley High School) stepped in to keep the art theme going. They described the work of the Castro Valley Arts Foundation (CVAF) and the impact of having the Center for the Arts (CFA) on the high school campus and in the community. Murline, Randi, Candi as well as Bernie Kempen are members of the CVAF Board of Directors. Parvin is an ex officio member of the Board as was Jim when he was superintendent. The CFA was funded by bond Measure C in 2002. The mission for the Castro Valley Arts Foundation is to provide our students and community with artistic experiences that educate, enrich and entertain by securing resources for the Castro Valley Center for the Arts. The Castro Valley Arts Foundation (CVAF) has a unique partnership with the Castro Valley Unified School District (CVUSD). The Foundation is committed to augment the Center for the Arts infrastructure; ensuring requisite staffing, program development, equipment replacement and facility enhancements. The high quality educational, enriching and entertaining events that Castro Valley Arts Foundation produces at the Center for the Arts make a difference in our community. Read more about the CVAF and the CFA at http://www.cvartsfoundation.org/. Randy Vanderbilt described a new, spinoff project from his Castro Valley history project. He is working with local history expert Lucille Lorge to develop a shorter program at the Adobe Center for all 3rd grade students. He promised to show clips of the video at a future meeting. Murline, Randy, Candi, Parvin, Jim and Nick provided an interesting and informative presentation. 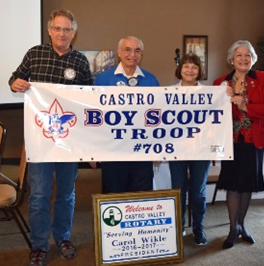 On behalf of the Rotary Club of Castro Valley, Ben Gurule presented Ceta Dochterman and John Aufdermauer a new banner for the troop. 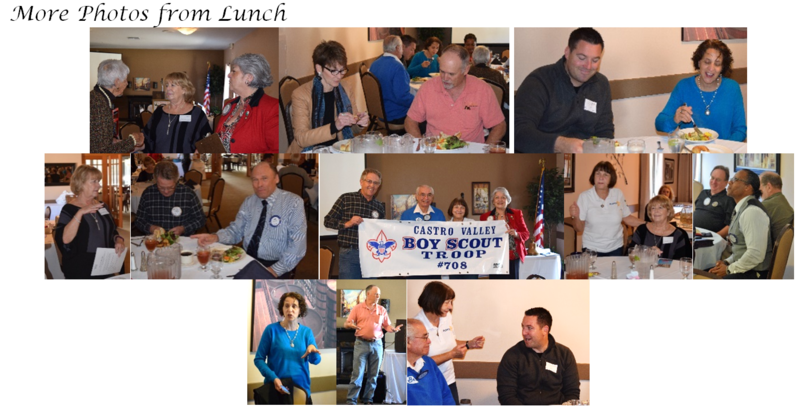 Ceta’s son is a current member of Troop #708 and John’s son is an Eagle Scout from Troop #708. Over the years, the Club has supported Troop #708 and the scouts have supported the Club at various events. President Carol recognized Charles Mortimer for his recent birthday as well as his recent marriage on his trip to England. After contributing his recognition dues, Charles described his trip to the south of Spain and Gibraltar. Congratulation to Charles and his bride. Michaela Thompson shared her background and the type of work that she does. She has a background as a CPA and is currently managing an office for a group of doctors. Additionally, she engages in entrepreneurial efforts in various areas. Michaela is currently assisting Todd Anglin as Club Treasurer and working on Chili Cook-off committee. She attended the District 5170 Avenues of Service conference and reported on her experience last meeting. President Carol informed Club member that Obese, Bill Nott, Kern Lewis and Cliff Sherwood finalizing the Rotary International Grant documents for the BREATHING FOR LIFE Project. Obse is currently in Ethiopia working on the project with the local Rotary Club and the government. Carol again requested that members contribute to this worthwhile In order to receive a tax deductible receipt from District 5170 be sure to include your full name and address on the check, and list Breathing for Life in the note section. 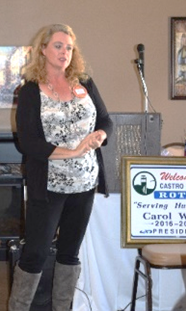 Heidi Hausauer announced that she is responsible for coordinating the judging for the Light Parade on Castro Valley Blvd. on Saturday, November 12. She is seeking eight (8) Rotarians to serve as parade judges. The parade starts at 5:30 p.m., but there will be various activities (e.g., live music, entertainment, food trucks, merchant discounts) in the street starting at 3:00 p.m. For more information, go to http://www.edenareachamber.com/castro-valleys-meet-in-the-street-light-parade. 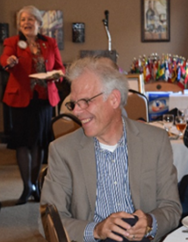 President-Elect Jim Negri announced the Club Holiday Party will be December 10th at 6:00 p.m. at the home of Heidi Hausauer. Invitations will be mailed this week so please check the Membership Directory to be sure that you have the correct address. The cost will be $40 per person and as always, there will be a white elephant gift exchange. 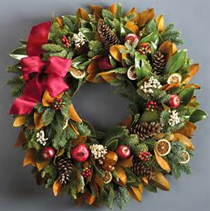 Please use the ClubRunner RSVP system to RSVP for lunch meetings and the Club Holiday Party.